Employees could be referred by their GP to Fit for Work centres four weeks after being signed off work, and might be offered services such as debt counselling as well as medical support, the national director for health and work, Dame Carol Black, has suggested. Work and pensions minister Lord McKenzie revealed that the government is already looking into the feasibility of piloting such a scheme. But it is not expected to make a formal response to Black’s proposals, contained in her review, Working for a Healthier Tomorrow, until the summer. Black’s comments came at the launch of the Confederation of British Industry (CBI)/AXA annual absence survey, which showed absence levels down slightly this year. Employees are on average taking 6.7 days off, against seven last year, costing the economy £20bn in direct and indirect costs. Lord McKenzie’s own review of vocational rehabilitation, due to be published by the summer, is expected to reveal how effective rehabilitation measures are in helping people return to work. The government is also planning to produce guidance on how long employers should expect workers to be away from work following surgical procedures, said McKenzie. In an implicit criticism of the profession, Black said that she had been shocked at the lack of a nationwide delivery of OH, rehabilitation and wellbeing. “It is ridiculous that OH is only available if you are working in the NHS or lucky enough to be working in a company that has its own occupational health service. I would like to see, to put it bluntly, a national occupational health service,” she said. 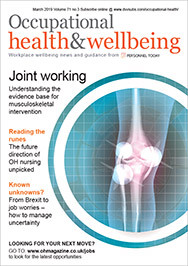 More than three quarters of employers polled in the survey now operate rehabilitation policies, a three-fold increase since 2001, with OH, counselling and flexible working, the most common services.